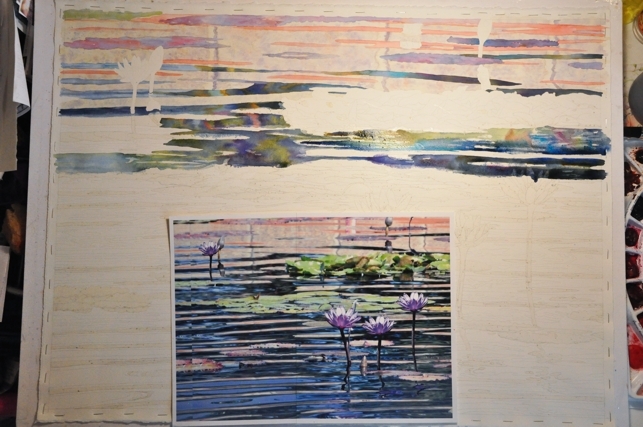 I began posting about this watercolor painting demo of waterlilies on April 29th with Stage 1 (see link). Since then I have posted several times with videos taken while painting. These videos can be seen on My Videos Tab. I will be adding more videos as I have them ready, so check back. To walk you through the steps seen here I began with the upper background water. This water had a reflection of something creamy and a peachy, orange pattern on that (Image 1). 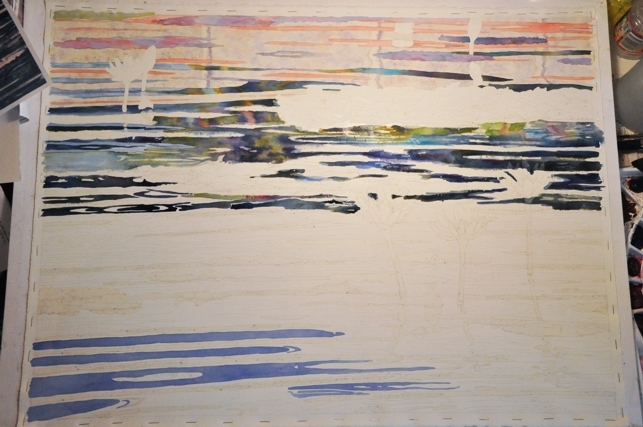 In the second image, I have started working on the darker parts of the background water. I looked for the changes in the values and color in these areas. 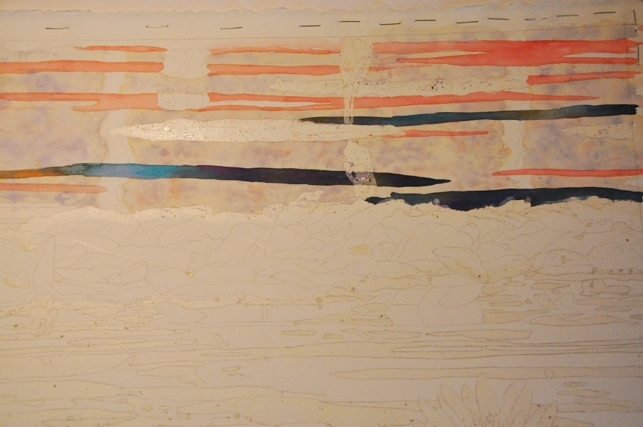 Parts of the painting are still blocked with masking, that I will remove later. I have also started painting some of the blue sky reflections. I am trying to paint this background water in one pass, so that it remains fresh. In the third image you can see how far I am on this full sheet painting (this was actually several weeks ago). 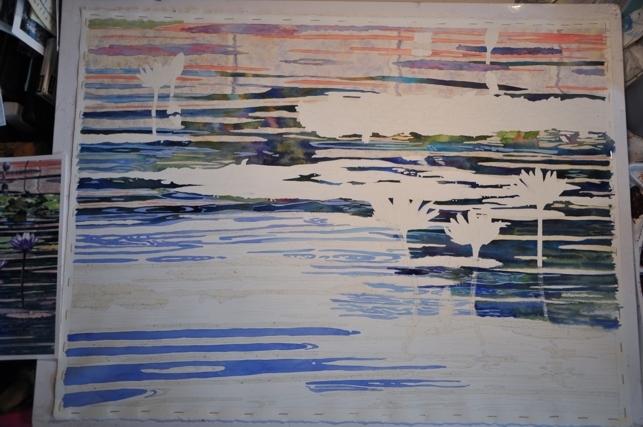 I continue to work only on the background water and reflections. I will save the waterlilies and lily pads for later. In between painting, I take the painting around to different parts of the house. While I am busy doing other things, I can look over at the painting and evaluate where I am at. the darker water and went to the blue sections so that I could make sense of the puzzles pieces that make up the water. 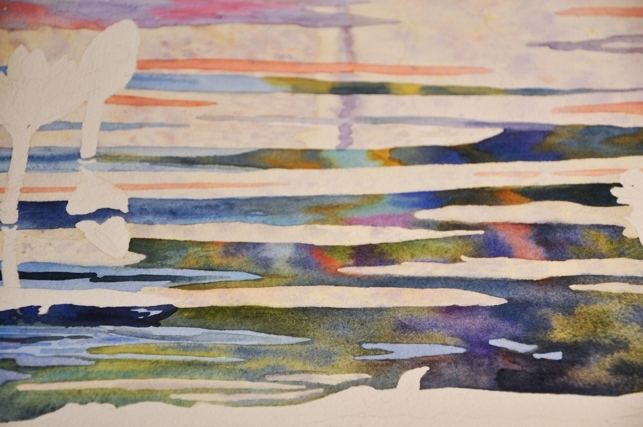 I continue to look for parts of the water that look wet-into-wet and for sections that are more hard edged and bold. Please check back for the next stages and if you have any questions leave a comment and I will answer them on this blog. Looks great Lori - can't wait to see the finished painting! Thanks for sharing your process, progress and your videos. You make it look too easy! I am trying to get this piece finished to enter in the National Watercolor Society show by July 9th. I better get back to it!